Okay. No kvetching! You can park on both sides of the street now. The snow will be here for a while, but the air feels a lot better, light enough for us to seemingly glide down sidewalks without having to brace ourselves from the previous months’ harsh elements. 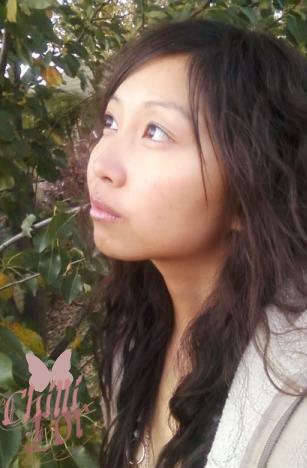 They say March comes in like a lion and goes out like a lamb. Here, that image rings as thinly as that story about the groundhog. I can’t think of a good animal to reference in an allegory fitting to this Minnesota winter, but it does not matter. It’s nicer out. 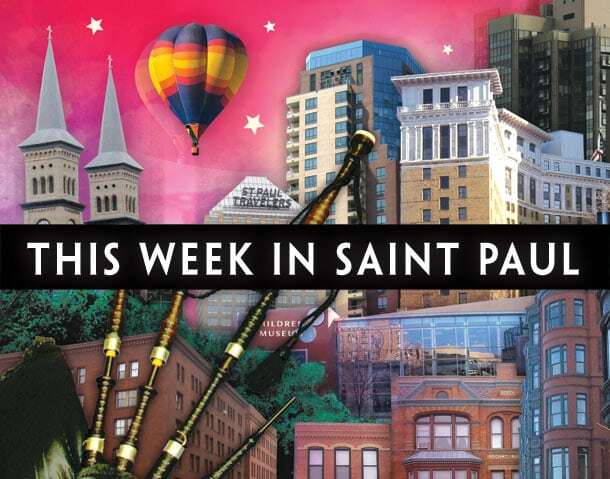 Let’s greet it with art in our 20th edition of This Week in Saint Paul! Hieu Minh Nguyen (pictured right) is a smart, funny, and talented storyteller and spoken word artist whose performances are delivered with brilliant presence. He has added his voice to both the Almanac’s Soul Sounds Open Mic and the Lowertown Reading Jams. His strong stories, flavored by his growing up as a Vietnamese immigrant’s son, provide a platform for all of us to explore identity, perspective, and our consciousness of the world around us. On Wednesday, April 2, Hieu will be at CAMP Bar for the release of his new book of poetry, This Way to the Sugar (Write Bloody Publishing, 2014). The event will be hosted by Guante (pictured left) with performances from the likes of Soul Sounds Open Mic curator Tish Jones, Keno Evol, Neil Hilborn, Sierra DeMulder, Kevin Yang, Allison Broeren, and Aimee Renaud, many of whom are no strangers to Almanac stages. 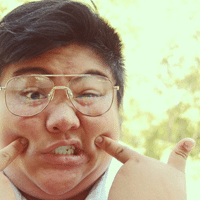 Hieu’s talent has been tapped to co-coach the 2011 University of Minnesota poetry slam team, which placed fourth at the College National Poetry Slam. 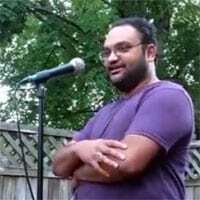 In 2011, he was also a member of the fifth-ranked Minneapolis adult National Poetry Slam team. 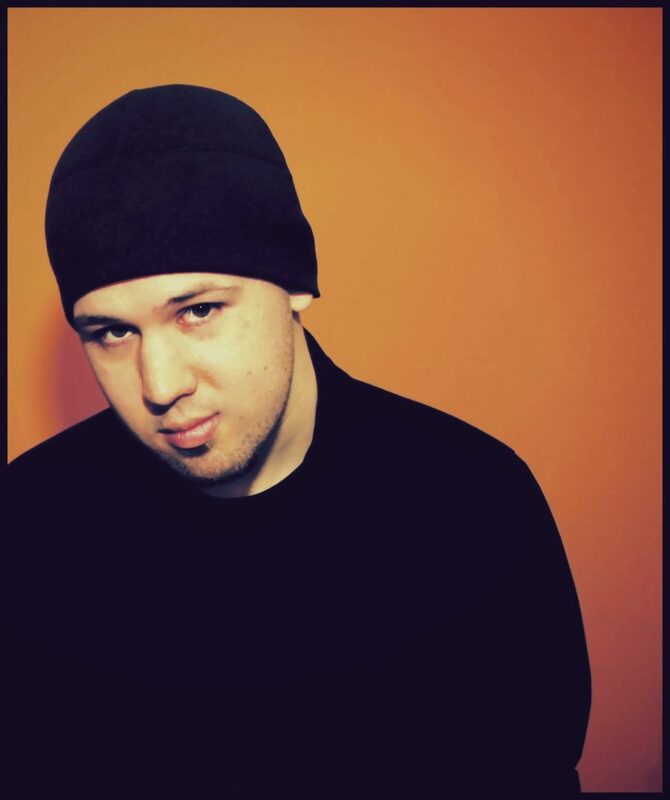 He has been a part of the local poetry community since he was 14 and, at 22, has built his credentials in other local and national venues. 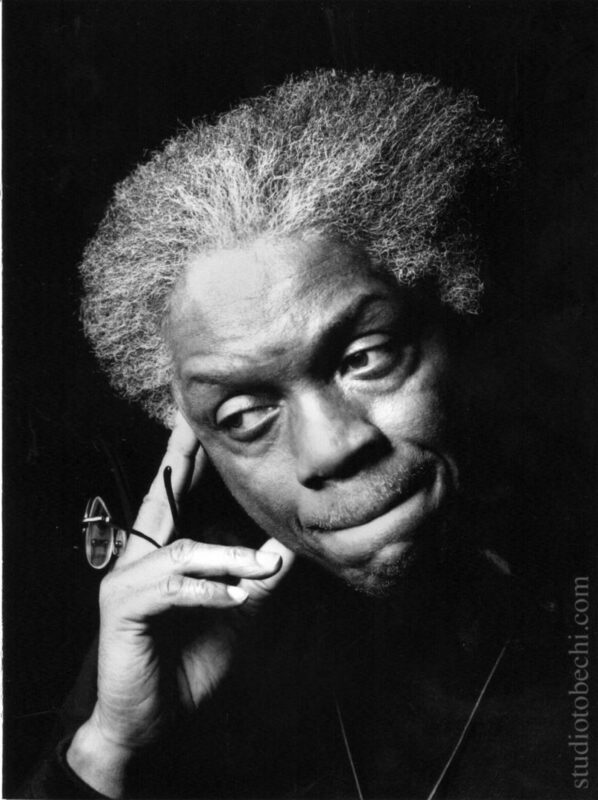 His work has appeared in several magazines and is worth experiencing in person. The doors for Wednesday’s event open at 7 p.m., with the show beginning at 8 p.m. The CAMP Bar is at 490 Robert Street in Downtown. Last fall, Satish Jayaraj (pictured left) and Cracked Walnut organized the Saint Paul Almanac’s post-book release reading series. 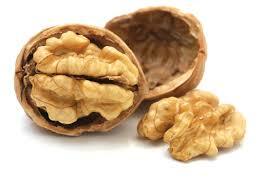 Cracked Walnut has its own reading series that began in 2011. As they tell it, the series heightens “awareness of the extraordinary and diverse writing talent residing in the Twin Cities, and the writers’ ability to directly touch an audience of listeners.” April 2 marks the beginning of Cracked Walnut Literary Festival 2014. Readings will take place across the metropolitan area and some will even happen in Greater Minnesota. Each event will have a theme. This week, on Wednesday, April 2, The Coffee Grounds will be the venue for “Mirror Mirror on the Wall” featuring Laurie Hertzel, Kelly Hansen Maher, Maya Washington, Nick Metcalf, Chilli Lor (pictured left), and Hawona Sullivan Janzen. (Again, a lineup with a couple of Almanac veterans.) The Coffee Grounds is at 1759 Hamline Avenue North. The event begins at 7 p.m. On Saturday, April 5, our friends at the Black Dog Coffee and Wine Bar will host “What Does Your Fox Say?” Another great lineup includes Mona Susan Power, Wendy Skinner, Ardie Medina, Brian Baumgart, Marjorie Hakala, and George J. Farrah. The Black Dog is at 308 E Prince Street in Lowertown. This show also starts at 7 p.m. 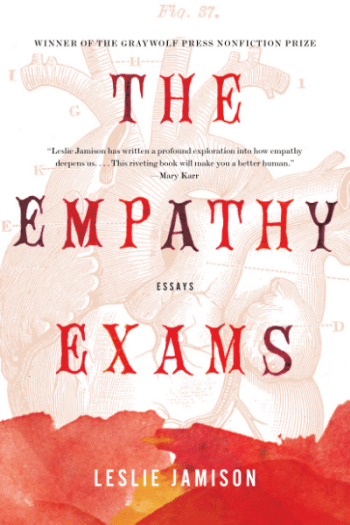 In her new book The Empathy Exams, Leslie Jamison takes a look at how we respond to pain—both ours and the pain of others. On Monday, March 31, she and Graywolf Press editor Jeff Shotts will discuss her work, which is laid out in eleven thoughtful and heartfelt essays of honest, personal reflection. As key to civil society as it is to the connections we make to our second and third tiers of neighbors, empathy is a timely topic that shapes our political discourse as much as it guides our friendships. Monday’s discussion will be at Common Good Books, 38 South Snelling Avenue, at 7 p.m.
On Thursday, April 3, Professor Emeritus at Macalester College Mahmoud El-Kati discusses his book The Myth of Race, the Reality of Racism. Professor El-Kati has long been one of the most articulate and socially engaged thinkers and writers on issues distinct to American culture and the implications of life in a historical, global context. As well as his commentary on art, culture, sports, economics, history, and global issues, he has added his scholarship to honest discussions about the contemporary and historical issues of race, class, and other “elephants in the room.” Whether he is talking about the origins and context of hip-hop or the lasting effects of the colonial slave trade, El-Kati provides an essential perspective to our conversations. 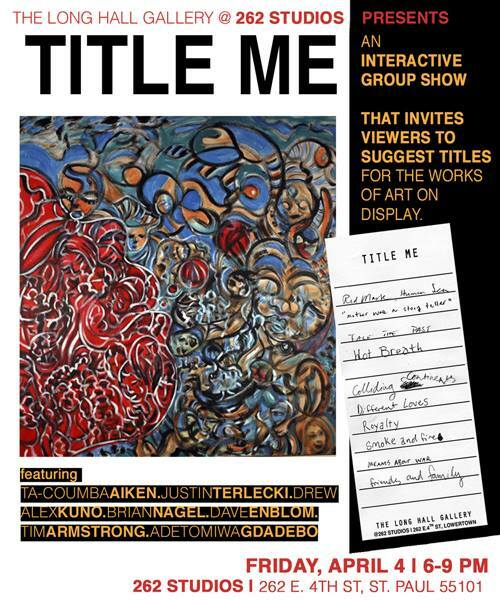 Wednesday’s event is at SubText: A Bookstore, 165 North Western Avenue. The discussion starts at 7 p.m. When people think of Pope John Paul II, they usually don’t associate progressive issues such as environmentalism. While the current and seemingly more progressive pope has taken the name of Francis, Mary Beth Lorbiecki explores how John Paul II took the lead from St. Francis to craft a vision of stewardship for the planet. On Saturday, April 5, she will be at SubText with her book Following Saint Francis: Pope John Paul II’s Call for Ecological Action. Local writer and editor Lorbiecki draws from the former pope’s words on the issues of climate change, ocean destruction, water scarcity, and poverty to illuminate the call to action. Saturday’s reading will be at 6 p.m. (an hour earlier than usual). Finally, the book event of the year, the Minnesota Book Awards will be held Saturday, April 5, at Saint Paul’s Union Depot. Come celebrate Minnesota’s rich literary tradition with this year’s nominees and a host of others who appreciate our women and men of letters. In the audience will be many of us from the Almanac community, including a past winner or two and most of the Community Editors for the 2015 edition of the Almanac. Check here for more information. The doors open at 7 p.m. Union Depot is at 214 East Fourth Street in Lowertown. There is currently a waiting list for tickets. On the first Friday of each month, many artists in Lowertown open their studios for Lowertown First Fridays. It is a sort of mini Art Crawl. (Look for the full blown Saint Paul Art Crawl at the end of the month.) This is a great chance to visit artists’ studios, watch artists at work, see live music performances, enjoy participatory events, watch dance, find out about classes and learning opportunities, run into a lot of interesting people and BUY ART! This month, Friday, April 4, things get started around 6 p.m. with the momentum of the evening taking Lowertown life past the 9 p.m. end time. If you don’t know where Lowertown is, just follow the tracks of the Green Line to the east, and you will find the energy. Friday, April 4, in conjunction with Lowertown First Fridays, check out Lowertown Classics #3. This is a new series that gives people the opportunity to hear classical music in a cozy, casual space. Each concert is staged in the third floor atrium of the Lowertown Lofts Artist Cooperative. To make the performances accessible, they are free, but donations are welcomed at the door. This program celebrates the 329th birthday of Johann Sebastian Bach. Performers include Eva Beneke on guitar, Marc Levine on violin, and Oleg Levin on piano. The program includes works by Bach, Rachmaninoff, and ragtime selections by W. Bolcom. Lowertown Lofts are at 255 East Kellogg Boulevard. Enter through the back alley (yes, this is a safe passage for those not familiar with Lowertown) and the show starts at 7 p.m.
How long has it been since you have heard a band play a good march? 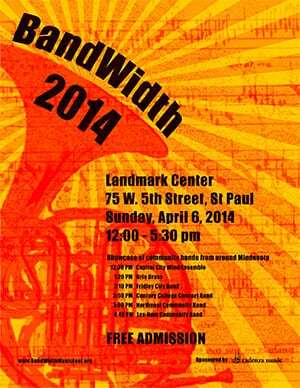 Well, as the month of March goes out kicking that is our April Fools, you can step into a more buoyant spring at the Landmark Center for BandWidth 2014. There will be marches and show tunes and an entire afternoon of lively music to greet the longer days of the season. Performing will be Brio Brass, Capital City Wind Ensemble, Century College Concert Band, Northeast Community Band, and the Lex-Ham Community Band. Music starts at noon on Sunday, April 6. This free event is in the Musser Cortile (the big open space on the first floor) in Landmark Center, 75 West Fifth Street, across from Rice Park. Also on Sunday, the Minnesota Guitar Society presents Chris Olson and Kris Anderson on stage together at Dreamland Arts. Chris Olson is a jazz guitarist who teaches at guitar and jazz camps in Shell Lake, Wisconsin, and at McNally Smith College of Music. Dr. Kristian Anderson is a founding member of the Tantalus Quartet and has performed throughout the world, including Carnegie Hall, the GFA Festival, the Iserlohn Guitar Symposium, and National Polish Radio. Dreamland Arts is at 677 Hamline Avenue. The event begins at 2 p.m.
Do you have a pre-schooler with whom you want to have some fun with book arts? The Saint Anthony Park Library is hosting Wacky Food Books on Tuesday, April 1. Kids will learn how to make books and then make their own wacky breakfast, lunch, and dinner books with materials from the kitchen. This fun starts at 10:30 a.m. Call 651-642-0411 with questions. The Saint Anthony Park Library is at 2245 Como Avenue (at Carter). 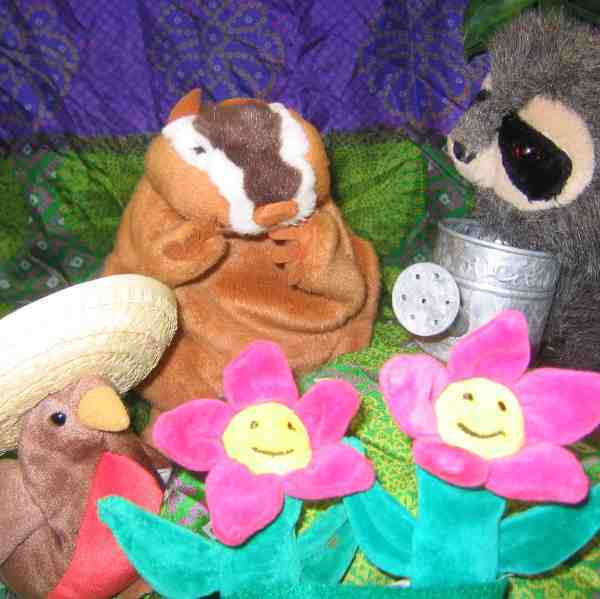 Also, back at Dreamland Arts, on Saturday, April 5, is The Stuffed Animal SPRING Show. This reoccurring show is billed as an “interactive theater experience for children and their stuffed animals.” Kids should bring their favorite stuffed animal and grownups should bring their camera as they join Zip the chipmunk for a kid-sized hour of fun. If you like, register online or give them a call at 651-645-5506. Again, Dreamland is at 677 Hamline Avenue. The show starts at 11 a.m.
Don’t tell me you’re bored. Don’t tell me the weather isn’t nice by Minnesota standards. Just tell me how much fun you had this week, and I will think of more stuff for us to do. There are many people around town creating events for us to attend, and as always, you can find more in the Almanac arts calendar. See you next week, right here, with more ideas.